Soy Protein is the only plant protein that is equivalent to animal protein. The one thing it does not have is all the contamination of viruses and bacteria that can be transmitted to us, as does the animal protein. Also, our digestive system can use soy protein better and more efficiently than animal protein. Soy foods contain all nine essential amino acids. The USDA evaluates Protein quality by Protein Digestibility Corrected Amino Acids Score. The PDCAAS measures amino acid patter of proteins and factors in digestibility. Soy protein has a score of 1.0, the highest score possible and equivalent to animal protein. The beans must be organically grown - Studies have shown decreased levels of food nutrients and increased levels of nitrate in chemically fertilized crops, when compared with their organic counterparts. There is a connection between the ingestion of nitrates and CANCER!! Therefore, it is essential no pesticides, fungicides, or herbicides used during the growing process of soy protein. Many companies use a powerful and deadly weed spray called Round Up, since the soy bean is such a hardy plant. It is very important your soy products are organically grown. The soy beans must not be genetically engineered - Soy beans genetically engineered are much cheaper to purchase, and MOST companies producing soy products look for ways to save money, rather than ways to protect your health. Each batch of protein must be checked to confirm that it contains the 9 essential amino acids - If one essential amino acid is missing, the immune system can be depressed 30% and many important body functions are delayed or stopped. Soil conditions and variable growing and harvest conditions, affect the quality and amino acid content. In the manufacturing process to produce the soy isolate, the crushed soy flakes must be water washed (not alcohol washed) - Washing the crushed soy flakes destroys isoflavone content up to 88%. The isoflavones reduce the risk of breast, prostate, lung and bowel cancer; as well as being beneficial in hormone balancing and increasing bone mass. The anti thyroid/anti-growth substance must be removed - Soy has been consumed by the Orientals for years. They always lightly cook their soy foods to deactivate the "anti-growth" substance. Find soy produced by a company that has an extracting process that removes this substance, yet keeps the soy in a raw form in order to maintain the highest level of Amino Acids and isoflavones which are very sensitive to heat. The process must be without heat - As stated previously, heat destroys isoflavones and amino acids. Inadequate brain development and hormones or other body tissue development can be the result of a diet lacking in essential amino acids. The soy isolate must have calcium added - The raw soy bean is a Neutral food, neither acidic nor alkaline. When the oil of the soybean is removed (which is essential so the soy powder will not go rancid quickly) the powder is acidic. Thus, adequate calcium, (which is alkaline) must be added to cause the powder to become neutral again. Many protein powder manufacturers do not add any or enough calcium. Check out the company that makes your soy protein. Soy foods are a particularly rich source of plant estrogens, which seem to have some of the same effects as estrogen. The benefits may include lower blood-lipid levels, decreased risk of hormone-related cancers of the breast, ovaries, endometrium and prostate, and relief from menopausal symptoms. A good soy protein can add quality years to ones life. It gives all the body all the requirements it needs from a protein and more. And Soy Protein can do it without adding all the fats and possible bacteria that can come from animal protein. 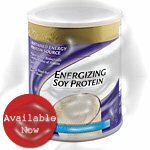 Soy Protein is the perfect choice for supplementation and one of the things I highly recommend as an essential for anyone's diet. For more information on a soy protein that meets the "Seven Essential" requirements, click here.